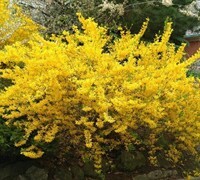 Originally discovered in 1935 growing in a garden called Lynwood located in Cookstown, County Tyrone, Northern Ireland, Lynnwood Gold is a vigorous, heavy-blooming forsythia noted for its spectacular late winter to early spring bloom of larger-than-usual bright yellow flowers. Thes flowers literally cover the branches with bloom before the new spring foliage emerges. The willowy green foliage emerges after the bloom cycle and is attractive throughout the season, turning purple in fall. 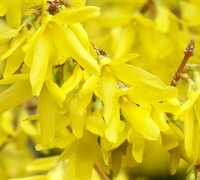 Give this forsythia plenty of room to grow as it can spread to 9 feet in width. 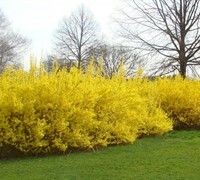 Forsythia is perfect for a natural mid-size, natural, flowering hedge, or as a specimen or in groupings. It fits in perfectly along sunny woodland borders. It also works well on embankments for erosion control. Try combining it with flowering quince, tulip tree magnolias and flowering cherry varieties that bloom in late winter to early spring. 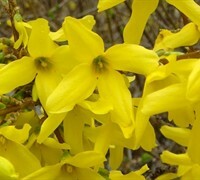 Forsythia is an exceptionally easy to grow plant that is not picky about soil as long as it is well-drained. 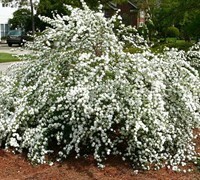 Full sun is preferred however the plant will tolerate some light shade. No pruning is necessary however the plant can be pruned for shaping after flowering.